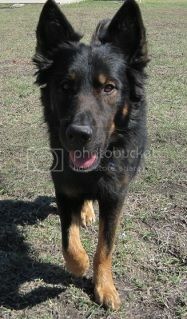 Petfinder says he has heartworms.. perhaps that's the reason for his return???? I'm thinking so. I think somebody adopted him, found out he had heart worms, and returned him. His previous listing didn't say he had them. What a pretty boy! I hope he finds a great home soon. Well I couldn't stand it any longer. 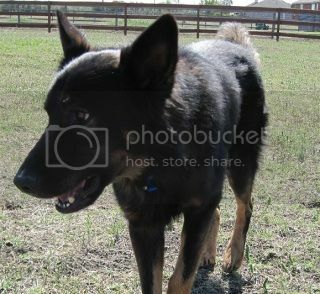 I'm going to get Bandit tomorrow and I'll be fostering him through Good Shepherd Rescue. Oh yay!! He's GORGEOUS!! 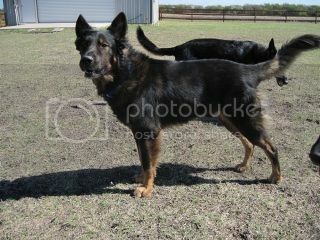 I'm hoping the beginning of next year/next spring to adopt, as long as Glock continues doing as good as he is. I keep seeing these gorgeous coaties that are making it difficult to wait! Thanks Emoore! Let us know when you have him. He's so handsome. Right now he's just running around the yard, barking this high-pitched, happy bark. I think he's happy to be out of the slammer. 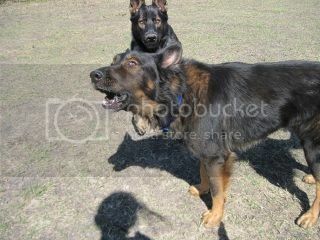 Kopper is about to pounce on him like a cat, in that last picture. That's exactly what happened. About .5 milliseconds after I snapped that pic, a huge game of chase-and-pounce ensued. What a lucky boy. And so happy!